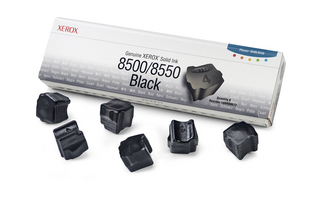 Genuine Xerox solid ink sticks are an integral part of our simple, intuitive supplies system - featuring interlocking ink shapes and a unique numbering system, making the ink loading process easy. Our high-performance solid ink formulations deliver brilliant color and sharp text every time, and can be used with either Xerox Phaser 8500 or Phaser 8550 color printers. They produce up to 6,000 pages (at 5% average area coverage). Genuine Xerox printers and suppliesThey're Made for Each Other. The Phaser 8500/8550 is no longer sold as new.